Utilising Apple’s new Bluetooth LE MIDI functionality, you’ll be able to plug in any USB MIDI controller into the Wej, and supported music apps can be played wirelessly. Wej has even been designed to place your iPad on, thanks to its angled, silcon based surface which is non slip. 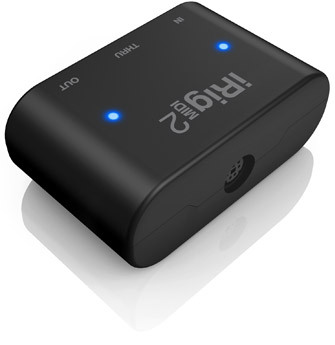 Best of all, Wej can power all connected USB devices and even recharge an iOS device when connected via USB. Designed to be used for both video and audio recordings, it features a patent-pending rotatable enclosure that you can easily position for the best stereo image in both landscape and portrait orientations. Now you can capture pristine sound no matter whether you’re recording a rehearsal or a concert, capturing audio for videography, acquiring audio for a music project, recording instruments while on the move, saving a lecture or speech or creating your next viral video hit — iRig Mic Field lets you create accurate and faithful field recordings in any imaginable context. iRig Mic Field’s combines high-quality components and unparalleled portability with a unique form factor. iRig Mic Field packs a 24-bit audiophile-grade A/D converter, a 44.1/48 kHz sampling rate, a 115 dB maximum SPL rating and a low-noise/high-definition pre-amp into an enclosure that’s small enough to slip easily into your pocket. Now you can get that Hollywood-style stereo sound anytime and anywhere, and you can get it in a mic that’s half the price of comparable microphones that cost and weigh twice as much and lack the flexibility of audio and video support. And with iRig Mic Field you’ll be able to record right out of the box thanks to its powerful included iRig Recorder Free app (version 2 is coming soon). It’s the easy way to record, edit and process stereo audio while in the field. And as if that wasn’t enough, iRig Mic Field is compatible with all Core iOS Audio and Video apps including GarageBand, Voice Memo, Camera and iMovie as well as all your favorite social media video apps and services. CUPERTINO, California – 10 September, 2014 – Apple® today announced iPhone® 6 and iPhone 6 Plus, the biggest advancements in iPhone history, featuring two new models with stunning 4.7-inch and 5.5-inch Retina HD displays, and packed with innovative technologies in an all-new dramatically thin and seamless design. The new iPhones feature a precision unibody enclosure of anodised aluminium that conforms seamlessly with the shaped glass of the display, resulting in a completely smooth and continuous surface. iPhone 6 and iPhone 6 Plus are engineered to be the thinnest ever, delivering a bigger display in a design that is still comfortable to hold and easy to use. For the first time iPhone is available in two new sizes: iPhone 6 features a stunning 4.7-inch Retina® HD display with 1334 x 750 resolution, providing 38 percent more viewing area than iPhone 5s, while iPhone 6 Plus features an even bigger 5.5-inch Retina HD display with 1920 x 1080 resolution, providing 88 percent more viewing area and nearly three times the pixels than iPhone 5s. The Retina HD displays offer advanced technologies including higher contrast for deeper blacks and dual-domain pixels for more accurate colours at wider viewing angles. Both models include the M8 motion coprocessor that gathers motion data from the accelerometer, gyroscope, compass and the new barometer, which senses air pressure to provide relative elevation. The M8 motion coprocessor can continuously measure your motion data, even when the device is asleep, saving battery life for fitness apps that use the sensors all day. With iOS 8, motion data from M8 appears in the Health app so you can see how many flights of stairs you’ve climbed, or how far you’ve walked or run. Developers can use CoreMotion APIs that take advantage of M8 and HealthKit to create apps that help you take better care of your health and fitness. The iSight camera gets even better with a new sensor featuring Focus Pixels for faster autofocus, making it easier to quickly capture any moment. iPhone 6 Plus users will also benefit from optical image stabilisation technology that compensates for hand shake in low light and works with iOS 8 to reduce subject motion. High-definition video on iPhone improves with faster frame rates up to 60fps for 1080p video and 240fps for slo-mo, as well as continuous autofocus, cinematic video stabilisation and time-lapse video. The FaceTime HD camera now captures over 80 percent more light with a new sensor, larger f/2.2 aperture and advanced new features including burst mode and HDR video. The new iPhones come with iOS 8, the biggest release since the launch of the App Store℠, delivering a simpler, faster and more intuitive user experience and new features including QuickType keyboard, a new Health app, Family Sharing and iCloud Drive. With more than 4,000 new APIs, iOS 8 allows developers to further customise the user experience with major extensibility features and robust frameworks such as HealthKit and HomeKit. iPhone 6 and iPhone 6 Plus users also have access to the revolutionary App Store, which offers more than 1.3 million apps* to iPhone, iPad® and iPod touch® users in 155 countries around the world. iPhone 6 comes in gold, silver or space grey, and will be available in Australia for a recommended retail price of AUD$869 inc. GST for the 16GB model, AUD$999 inc. GST for the 64GB model and, for the first time, a new 128GB model for AUD$1,129 inc. GST. iPhone 6 Plus comes in gold, silver or space grey, and will be available in Australia for a recommended retail price of AUD$999 inc. GST for the 16GB model, AUD$1,129 inc. GST for the 64GB model and AUD$1,249 inc. GST for the new 128GB model. Both models will be available from the Apple Online Store (www.apple.com/au/store), Apple’s retail stores, and through Telstra, Optus, Vodafone, additional carriers and select Apple Authorised Resellers. iPhone 6 and iPhone 6 Plus will be available in the US, Australia, Canada, France, Germany, Hong Kong, Japan, Puerto Rico, Singapore and the UK beginning on Friday, 19 September, and customers can pre-order both models beginning on Friday, 12 September. August 5, 2014 – IK Multimedia, the global technology leader in mobile apps and accessories, today announced it’s shippingiRig® Mic HD, the first mobile digital microphone for iPhone, iPad, iPod touch, Mac and PC. The sequel to IK’s popular iRigMic, iRig Mic HD is the perfect tool for singers, podcasters, online radio broadcasters, journalists, videographers, home studio enthusiasts and anyone else who needs to record high-definition digital audio on the go. 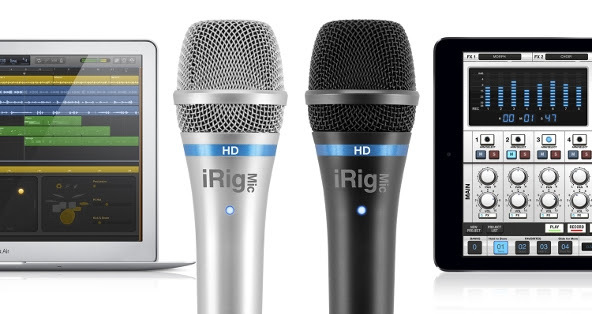 iRig Mic HD comes in black and an exclusive silver version is available only from the Apple Store. Powerful, mobile and affordable: iRig Mic HD is the first handheld digital microphone for everyone. iRig Mic HD is the only mobile digital condenser microphone designed for live handheld performance and recording. It delivers high-quality digital sound via an electret condenser capsule, a 24-bit audiophile-grade A/D converter (with 44.1/48 kHz sample rate) and a built-in low-noise high-definition preamp. iRig Mic HD sports an easy-to-use gain control that allows for optimum audio capture at any sound pressure level, from the quiet whisper of an ambient room to the full blast of a loud rock concert. A multi-colour LED provides at-a-glance monitoring of sound levels. 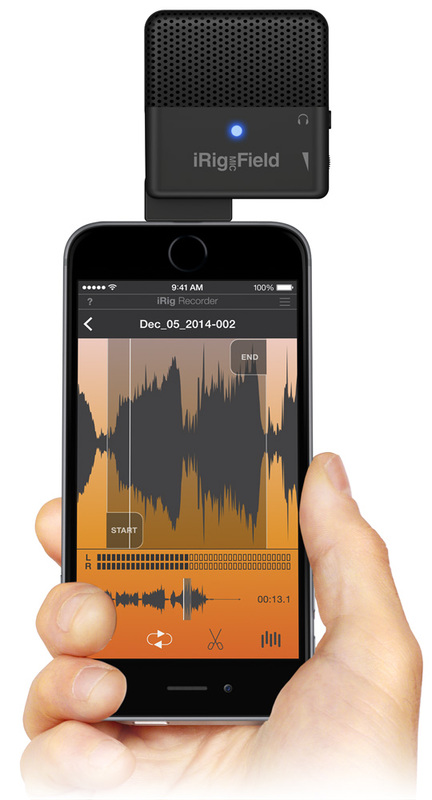 For immediate recording, iRig Mic HD comes fully equipped with a suite of powerful IK apps: iRig® Recorder for iPhone, iPad and iPod touch is a straightforward audio and editing app for field recording and interviews. VocaLive™ for iPhone, iPad and iPod touch is a powerful vocal effects and multi-track recording app with a suite of 12 professional real-time vocal effects. AmpliTube® for iOS, Mac and PC is the industry-standard guitar studio app that features ultra-accurate digital models of some of the world’s most desirable guitar amplifiers and effects. EZ Voice for iPhone, iPad and iPod touch is an easy-to-use vocal recording app that lets you sing-along and record with any song in your iTunes music library. iRig Mic HDis also compatible with a wide variety of third party apps, like GarageBand, Cubasis, ProStudio Vocal FX, MultiTrack DAW and more. iRig Mic HD is now available from music and electronics retailers worldwide for $129.99/€99.99 (excluding taxes). Anexclusive silver version is also available from the Apple Store. 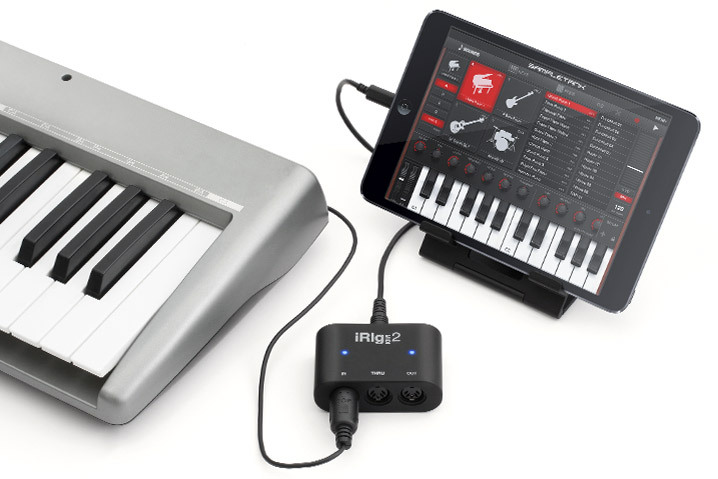 Introducing iRig MIDI 2, the first Lightning/USB compatible mobile MIDI interface that works with all generations of iOS devices as well as Mac and PC. 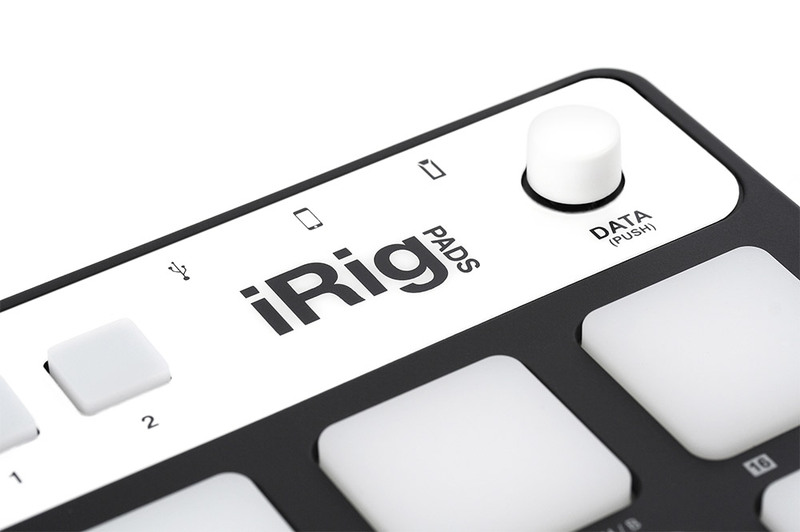 It features everything you loved about iRig MIDI but with even greater pocketability, connectivity and control. 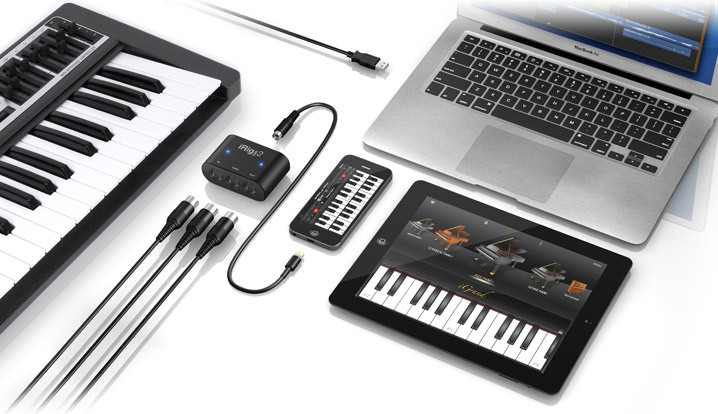 Simply put, it’s the perfect MIDI solution for the musician on the move. 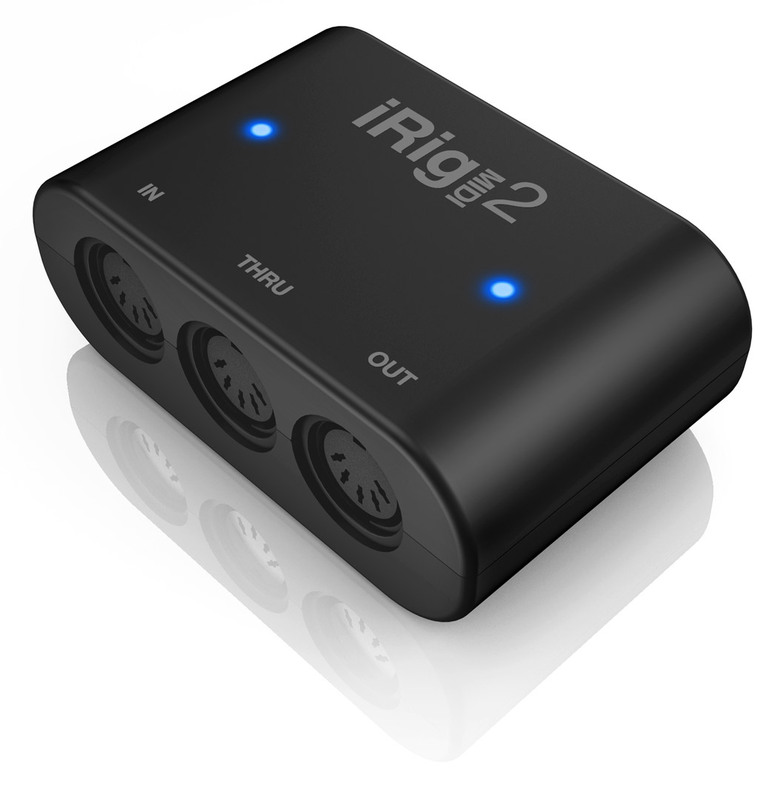 As we’ve said, iRig MIDI 2 is the first portable MIDI interface that’s compatible with Apple’s Lightning cable. This, however, does not come at the expense of universal support. 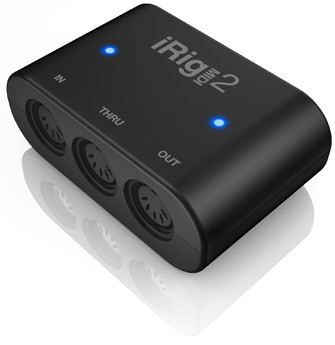 At the center of iRig MIDI 2 is its detachable Mini-DIN connector, which lets you attach a Lightning (included), USB (included) or 30-pin cable (sold separately) depending on the mobile device or computer that you’d like to use. 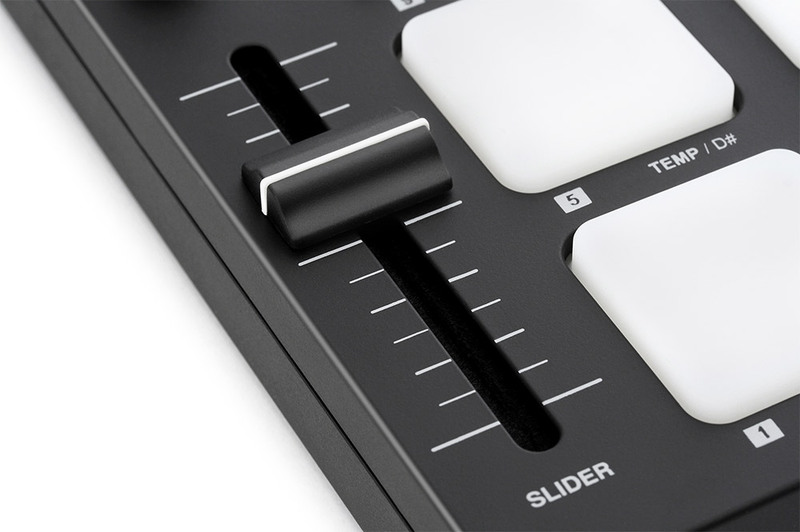 Now you have the flexibility to use MIDI with whatever device you want, anytime, and anywhere. 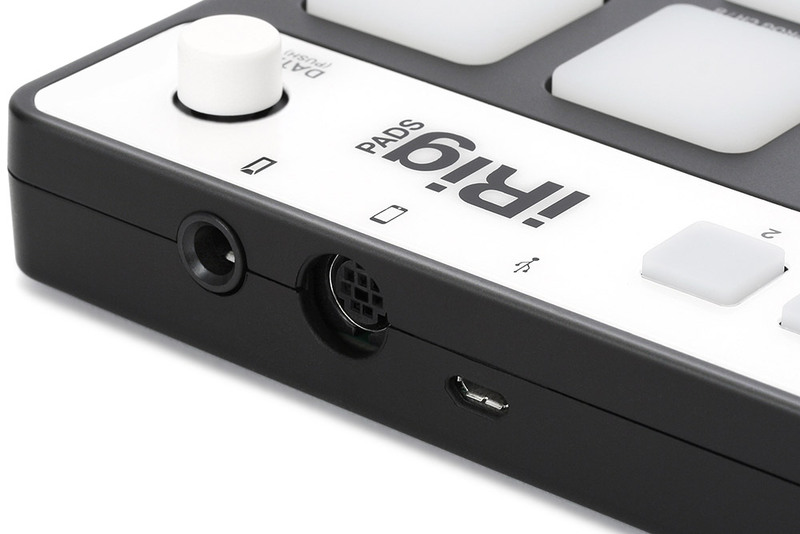 iRig MIDI 2 is small, but it can be made even smaller when all of its cables are detached. Because of its Mini-DIN connector, you can remove all cables for extreme portability: Now you have something that you can easily carry with you in your pocket to any gig, performance, studio or jam session. In addition, all iRig MIDI 2 cables are bumper friendly, which means you can connect and start jamming without having to remove your mobile device’s protective carrying case. 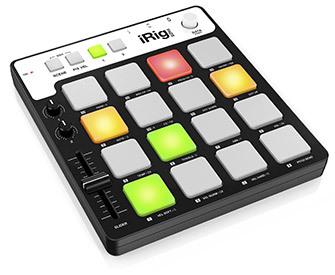 Like iRig MIDI before it, iRig MIDI 2 features three MIDI ports: IN, OUT and THRU. But this time around the ports are standard-sized and require no adaptor or special cable to use — in fact, you can use any standard MIDI cable you’d like. These ports give you all the control and connectivity that MIDI allows: Use the IN port to use external keyboards and controllers to play your favorite software sound modules and synthesizers. 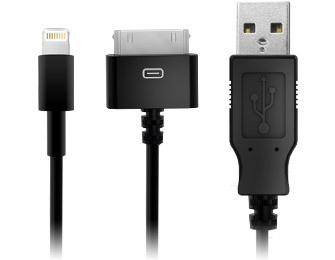 Use the OUT port to control external hardware or synthesizers from your mobile device or computer. And you can use the THRU port to send MIDI data to multiple instruments at once. Monitoring MIDI data with iRig MIDI 2 is easy, it comes with two LEDs that give you an at-a-glance readout of the note data as it passes through the IN and OUT ports. With iRig MIDI 2, you get more than just a supremely portable MIDI interface; you also get a full suite of music creation apps. As soon as you open the box you’ll be ready to go. iOS users get two of IK’s most popular mobile apps: SampleTank FREE is a sound and groove workstation filled with hundreds of high-quality instruments and patterns. iGrand Piano FREE is a concert-quality piano app that puts world-class piano sounds at your fingertips. And Mac and PC users can enjoy the full creative power of SampleTank 3 SE, a free version of IK’s next generation SampleTank 3 desktop sound workstation. 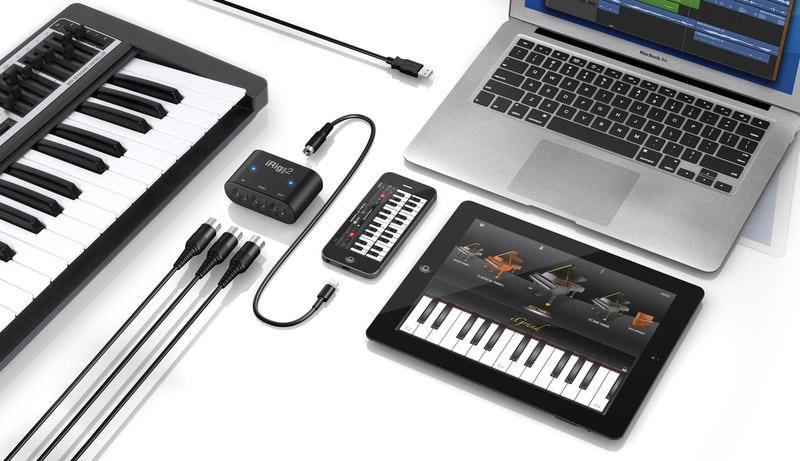 Beyond all that’s included, iRig MIDI 2 works with all MIDI-compatible Mac and PC software as well as the entire spectrum of Core MIDI apps for iOS such as GarageBand, Cubasis, Beat Maker 2, Auria and many more.